Reiki: Jin-Kei-Do is a lineage or style of traditional Reiki practice emphasising the path of Reiki as a spiritual development with health supportive characteristics. Its philosophy is grounded in the traditional views of Reiki, and like much of the Reiki taught and practised in the West it shares Mikao Usui and Chujiro Hayashi in its lineage. Its distinctive philosophy or emphasis arises through the lineage that followed. From Dr. Hayashi the teachings were transmitted via two Buddhist monks and later by several Buddhist practitioners. Venerable Takeuchi received training from Dr. Chujiro Hayashi. 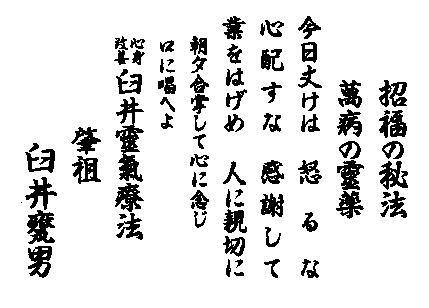 Little is known of Venerable Takeuchi, he was a contemporary of Dr. Usui, and some hypothesise that he studied with Usui or was related to Dr. Hayashi, but these points are as yet unproven. 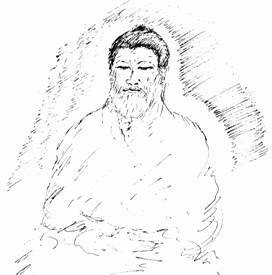 Dr. Hayashi did transmit form and teachings of Reiki to Venerable Takeuchi that included a series of meditations, said to be those Usui had practised on Mount Kurama. 1 These meditations continue to be part of the additional teachings of the lineage. Venerable Takeuchi was an abbot of a small remote Zen temple where he administered Reiki to his followers. One student Venerable Seiji Takamori, who entered the monastery at 19 years of age, at a later date asked to be taught this practice. Over a period of 3 years, Venerable Takamori received training through the 3 levels or degrees of Reiki and he too helped in administering to the followers. Venerable Seiji Takamori was instrumental in bringing this line of Reiki teachings to the West. Some time after he received training he asked his teacher Venerable Takeuchi, if he could leave the monastery and go on a search for further teachings relating to Reiki and Buddhist practices. With permission he embarked on a quest that would lead him through the Buddhist countries of Asia. In an isolated part of Nepal, he came across a small order of monks whose practice included a discipline similar to Reiki. This ancient system of healing contained two of the Reiki symbols and echoed the Buddhist teachings 2 he was given by Sensei Takeuchi. Venerable Takamori decided to stay and study with three of the monks and was directed to a more advanced monk further into the Himalayas, whom he studied with for 7 years, receiving the deepest training on his progress to enlightenment. Contained within the training, were practices, teachings and symbology that paralleled the teachings he had received from Venerable Takeuchi, but was more extensive. Thus he concluded, Usui had connected with the same stream of Buddhist teachings. After completing his studies in the Himalayas, and with his teacher’s blessing, Venerable Takamori continued his travels for study and teaching. His goal was to develop the healing system and his own mind, whilst helping others on his long journey. Venerable Takamori was an explorer of healing methods and the human mind, helping others whilst on his journey of exploration towards healing through meditation. During his travels Venerable Takamori had heard of another teacher (master) of Reiki in the West called Hawayo Takata, who had studied with his teacher’s teacher, Dr. Hayashi, so in the early 1970’s whilst in the West he met her. Venerable Takamori continued travelling and teaching wherever he was requested and would be supported by those requesting teachings. Eventually in 1990 he transmitted his line of Reiki teaching and the additional studies (now including the quintessence of the Buddhist Yogic Tradition 3 to Dr. Ranga Premaratna PhD in the USA. 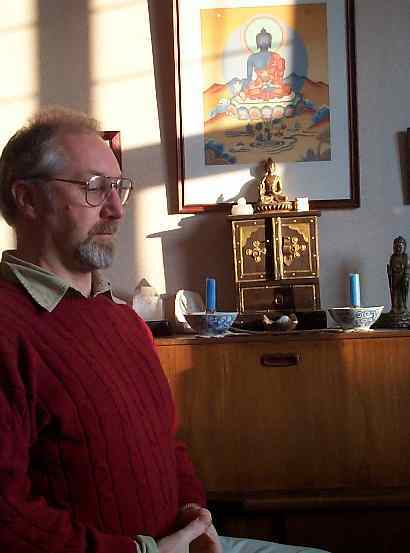 Later, as Ranga Premaratna explored and practised the intensive training, he began teaching what was to become Reiki Jin-Kei Do – the modern title for the lineage and teachings. Mikao Usui, Chujiro Hayashi, Venerable Takeuchi, Venerable Seiji Venerable Takamori, Dr. Ranga Premaratna PhD. (Lineage Head). The name of the form, Reiki Jin-Kei-Do, was first used in 1997 by Ranga Premaratna. Whilst there were distinct differences between its relatives in the Hayashi/Takata lines it was felt that a name for the style would help clarify its position. Prior to this it had no name, and confusingly, it was being called a variety of things such as "The Eastern Lineage of Reiki". It was clear that it was not the only "Eastern Lineage of Reiki". The choice of the name more importantly reflected the philosophy of the teachings. "Jin" is Japanese for compassion and represents the Buddhist concept of universal compassion known as "Karuna" in Sanskrit. Karuna 4 is one of the fruits of deep spiritual training. "Kei" is Japanese for wisdom, and represents Buddhist understanding of universal wisdom known as "Pragna" in Sanskrit. Pragna is another fruit of deep spiritual practice. "Do" is Japanese for "way" or "path" (Tao in Chinese), and links the ideas that Reiki is truly a path of spiritual development that integrates healing and meditation. Commencing with oneself, through self-treatment, self-awareness, developing compassion for ones own suffering and condition of body and mind. Through actively working to bring harmony in oneself, one awakens universal compassion in the heart, which is expressed by supporting others though Reiki. Thus one develops insight into the nature of life (and death), seeing the oneness and unity of all things in this universe of energy. Through meditation, through ‘meditation with the hands’ (Reiki practice), one develops insight and wisdom, losing much of the ego-centred characteristics of the mundane mind and living fully the principles of Reiki. The five Ideals of Reiki originating with the Meiji emperor have been interpreted a little differently in the various schools of Reiki. Here we see how the spiritual vision of Usui continued in the minds of adherents and expressed the positive mind of meditation. As the Buddha pointed out; all life is Dukkha (Sanskrit: unsatisfactoriness/suffering). It is enough to be aware of the existence of negative states of mind/emotions, not to deny them but to use them as compost in which to grow the positive or more skilful. Thus compassion is the antidote for anger. By being aware and living fully in the moment we free ourselves of worry. Thus ultimately we release our anxieties, attachments, seeing clearly into the nature of existence we are set free of unnecessary suffering. As we look moment-by-moment we see the conditioning of our body and mind, see the effects of unskilful action and how suffering is created. Thus, true wisdom (Kei – Pragna) is activated in our lives. To observe the arising of greed, anger and delusion, looking deeper for their true cause. To see within the ever changing nature of your mind and body. By following these ideals daily, your mind and body will truly transform with the power of Reiki. What constitutes the training in Reiki Jin-Kei-Do? As a school of "traditional Reiki" (for want of a better term), the general format of training follows the usual structure: Three degrees of training, four attunements at 1st Degree, one at 2nd Degree and one at 3rd Degree. It is seen as a complete system, each level complete in itself, not requiring any prerequisite for commencement of training, but each level being the prerequisite for the next level of study. The lineage guidelines state that the training have a minimum of 3 months after 1st Degree and two years after 2nd Degree. Training at the first two degrees is over a minimum of two days, with additional course study, practice and feedback. At 3rd Degree the training is over 1 year. Practitioners of Reiki Jin-Kei-Do operating as Reiki Therapists are required to follow codes of Ethics, subject to local variations. E.g. here in the U.K. we have adopted the code of ethics of the UK Reiki Federation 6 of which we are members. 1st Degree is a foundation, in the full sense of the word in that to build a strong building/structure or practice we need a sound foundation. The student is introduced to: a form of practice of hands-on treatment for self and others; meditation practice and ‘meditation with the hands’ during Reiki practice; methods of self-awareness developing the Ideals of Reiki; energy exercises to assist the student fine tune awareness of the flow of Reiki. At 2nd Degree, the first three symbols of Reiki are presented with a deep level of insight and understanding of their background, meaning and functionality. 7 Again this is an expression of the insight and understanding contained within the practice of Reiki Jin-Kei-Do, and is an encouragement for self-reflection and personal growth rather than intellectual or academic mind training. Further treatment forms are used for self and others incorporating the body’s energy fields, energy points (marma/tsubo) and energy pathways (nadi/meridian) and includes absentia Reiki. Continued development of meditation practice and self-reflection. Students are encouraged to practice on self and others using a variety of treatment methods. At 3rd Degree, the fourth symbol is explored through meaning, philosophy and practice. Additional studies of energy systems, both theoretical and practical enhance the deeper experience of the flow of Reiki within. As progress is made, the syllabus of 1st and 2nd degree is studied in depth simultaneously with their respective attunements. After at least 1 year of practice and teaching, the Master attunement is studied and perfected and the year’s practice is reviewed. Training in Reiki Jin-Kei-Do does not incorporate any channelled or new-age material, philosophies or disciplines. It stays with teachings and practices that have been tried and tested and proved true through time, whilst open to the verification processes and scientific understanding gleaned in the modern day. One essential difference in the teachings of Reiki Jin-Kei-Do is the attention to the detail in the attunements. In Reiki Jin-Kei-Do, attunement is performed one-to-one or in small groups. To prepare the body/mind for activation/tuning care is taken to balance the body energy and assess throughout the process of attunement the effectiveness of the attunement. Consequently, each attunement may last around 20 minutes per person, or a little more in a small group. One of the repercussions is that training classes are often quite small, perhaps up to 6 to 8 trainees per initiating master with attunements given in separate sessions. We have a strong emphasis on self-treatment and self development. By focusing on the four upper chakras and palms and developing within the heart; compassion (Sanskrit: karuna), unconditional love/loving kindness (Sanskrit: metta) towards oneself, we open our hearts to this immense field of supportive universal energy. We fill ourselves with Reiki (compassionate-wisdom energy) and we open our hearts to support others. From second Degree onwards the inherent power of the Reiki symbols help amplify and focus this universal energy. By developing understanding of the deeper meanings and functions of the symbols the true power of the Reiki symbols are released and realised. Assisting the mind harmonise and balance towards its universal state through deep relaxation, focus and meditational experience (Samadhi). The symbols are viewed as a vehicle or access tool towards pure undifferentiated energy of the universe. Through Reiki practice, combined with meditation we gain understanding and wisdom, bringing balance and harmony to body and mind. Practically in this life, the body and mind are always going out of balance. The influences of the outer and inner environment, conditioning of the past, present and future, through constant change or impermanence, lead the aware practitioner to find within themselves their True Self, or non-Self. Whilst Reiki may appear to be a complimentary therapy for self and others it has within it, a motivating force of awakening, or enlightenment, in Buddhism it is called the Bodhicitta. The founder, Dr. Usui realised this and wished that all who took up this simple and universal system called Reiki would be supported both materially and spiritually. I like to think of Reiki as a colourless liquid, such as the ‘water of the spirit’. It nourishes all (all beings); it fits any container (any sound philosophy of life) and assists all functions of body and mind. In our discipline of Reiki Jin-Kei-Do, the Way of Compassion and Wisdom through Reiki, we aim to assist ourselves and others by promoting a balanced development of body and mind. 2 Modern day research has revealed the Buddhist tradtitions with practices similar to Reiki. These traditions utilise; mantras (ancient words of mystical power), yantras (visual objects of mystical significance), meditations and physical meditation movement resembling yoga/chi kung for activation of the body's energy matrix and the deepening of spiritual experience (samadhi) and understanding (enlightenment). 3 Before Venerable Seiji Takamori's death at a Buddhist monastery/retreat in Sri Lanka at 83 years of age in 1992, the Takamori's teachings were named EnerSense by Dr Ranga Premaratna to differentiate them from other existing Buddhist teachings and to avoid confusion and give a new identity to these consise teachings. The name chosen is derived from the words Energy and Sense. They are also known as Buddho-EnerSense, which relates to a Buddhist term used within the teachings. 4 The Buddhist term "Karuna" should not be confused with the modern school of "Karuna Reiki" - a system developed by William Rand from the channelling of Kathleen Milner/Marcey Miller which became "Tera-Mai Reiki". 5 Reiki Ideals: Various versions of the ideals exist, most popular are those presented by Hawayo Takata. Here, is presented one version used within the teachings of Reiki Kin-Kei-Do, inspired by the copy of the ideals on Usui's memorial stone at Saihoji temple, Tokyo, and through the mind of wisdom and understanding of the practice of Reiki expressed by Venerable Seiji Takamori and Dr. Ranga Premaratna PhD. 7 Information on the Reiki Symbols: Perhaps because the lineage teachers have been Japanese speaking up to 1990 and the tradition has been held by advanced spiritual practitioners, the depth of understanding of the Reiki symbols is quite extensive. Further insights and understanding are revealed to the student after Reiki 2 during EnerSense training and Reiki 3. Article written for the German language magazine "Reiki Magazin"
Japanese Kanji in running script: Reiki Jin-Kei-Do. Courtesy of Valerie Cochrane, London. Line drawing of Venerable Seiji Takamori by Dr. Ranga Premaratna. Courtesy of Dr R.J. Premaratna, Sydney. Photograph by the author of Dr. Ranga Premaratna PhD in Sydney 1995. 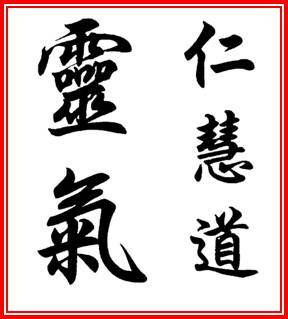 Reiki Ideals in Japanese kanji. Photograph of author in Newcastle upon Tyne. 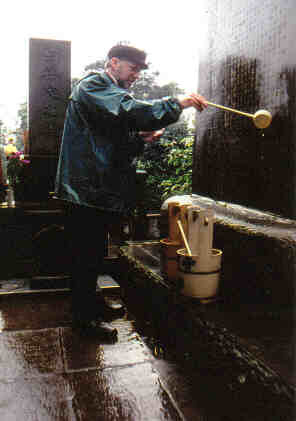 Photograph of author in Japan, 1999 at Dr. Usui’s grave and memorial stone.